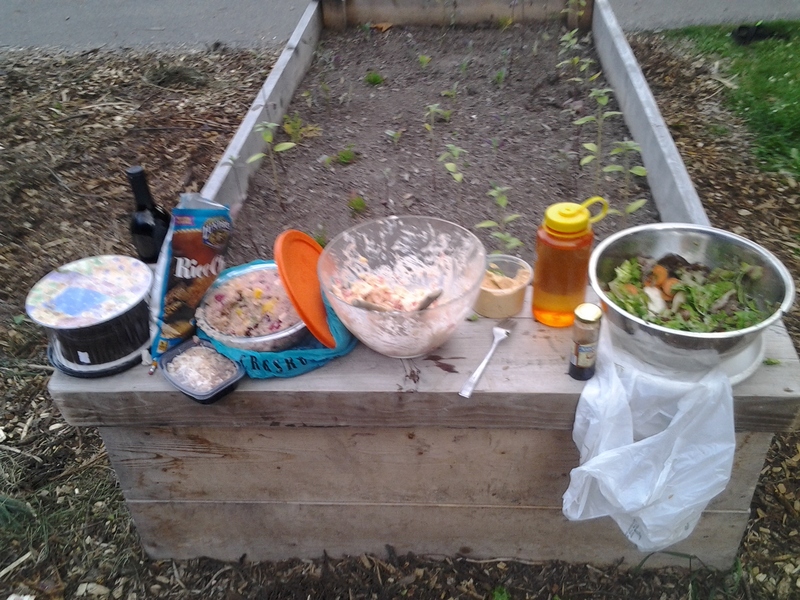 A delicious Solstice picnic dinner! After a few weeks of generally dreary weather and confused plants after a gorgeous May, the solstice turned things around in a major way and reminded us at Miller what summer was supposed to feel like! 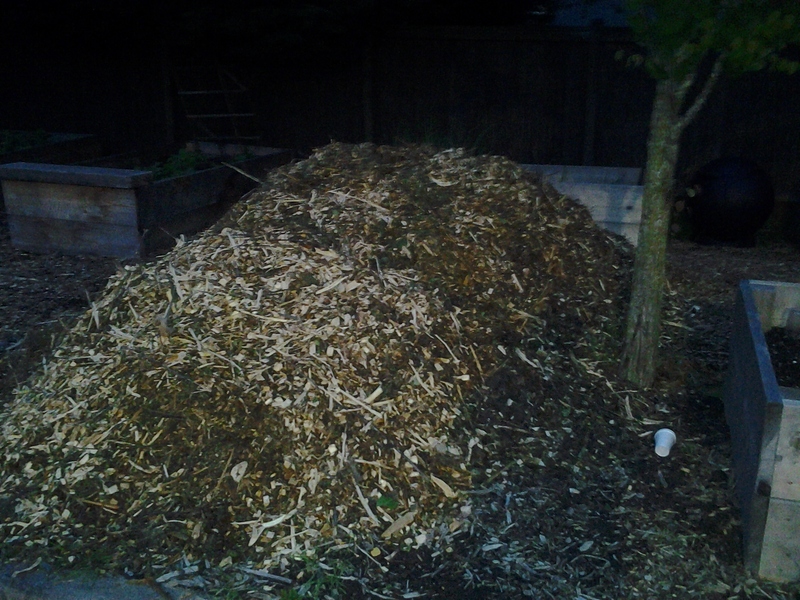 A glorious sunny day was the perfect time to spread the new wood chips that had been delivered the week before, awaiting the perfect time to permeate through the garden. At 7:30 however, there was only one person in the garden! 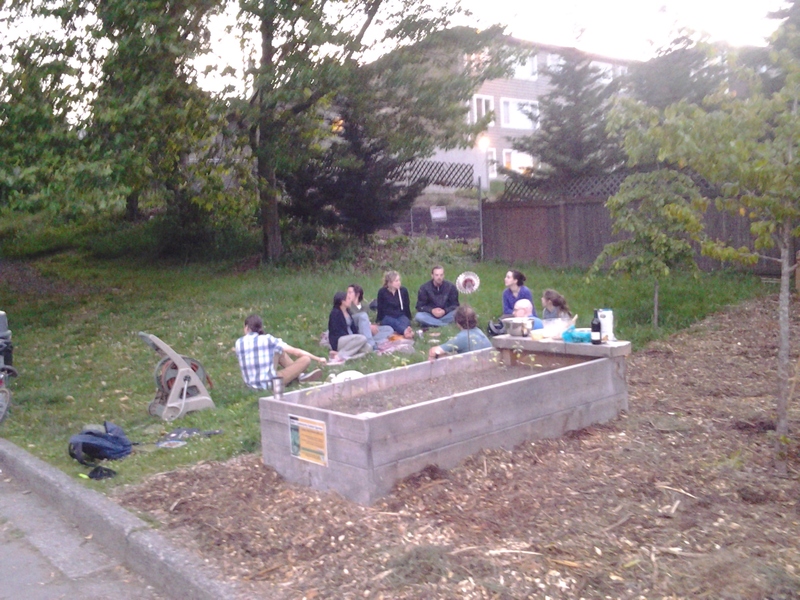 Fortunately, she knew it was Solstice, and since the sun wasn’t going down anytime soon, that people would show up. One by one, they wandered into the garden, adding their efforts to the enormous pile that lay before them. The work was slow going at first, but thankfully Chris was able to procure a wheelbarrow for the cause, which improved efficiency several orders of magnitude. As the gardeners worked, some friends started to arrive, bearing food and games. Plates, forks, and bowls were pulled out. The pleasant ringing of badminton racket on birdie could soon be heard, amidst jubilant laughter. Then, all of a sudden, it was done! The chips had all been spread! People sat down to eat the bounty that had been brought, and a delightful picnic in the park occurred right next to the garden. Apparently the solstice evoked the idea of salad, as there was rich, creamy pasta salad, a fresh green salad with sunflower seeds, a home-made hummus that smacked of lovingly stirred garbanzos, quinoa salad with a rainbow of fruits and a toasted coconut topping, and a extra rich chocolate cake that topped off the cornucopia in a spectacular way. Paired with the rich flowing conversation of what was turning into early evening after the sun finally went down, it was a splendid way to spend the longest day of the year. 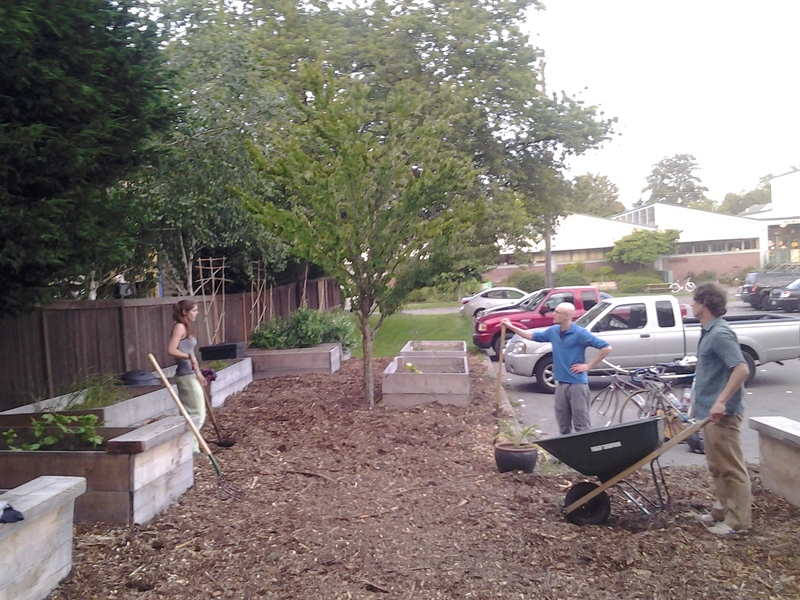 Join us for our next work party, and experience some of the magic!